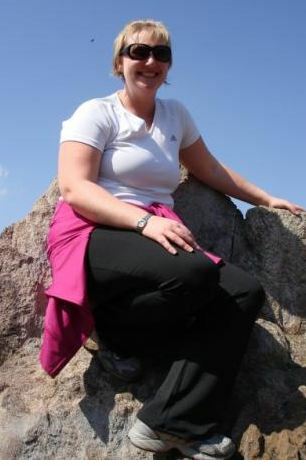 Me in October 2008 – pre weight loss journey! So, I figure it’s fair to a least give a bit of background information about me for those of you who may stumble across this blog without actually knowing me (hey – that COULD happen).I turned 30 this year, and was about 15 pounds away from my ultimate weight loss goal in October 2010 and then it seemed like the world as I knew it (in terms of losing weight) crumbled around me. In other words, I got married. No really, everyone keeps telling me that you gain weight when you get married. But what about those of us who are working just as hard at eating healthy, working out consistently and have not succumbed to take out bliss? About four years ago, I changed employers and my new gig came with this AMAZING gym that I could use. Having just ended a really bad relationship (sort of like “the song that never ends” for 3 years), it was the perfect time to really get serious about working out. This wasn’t my first affair with working out, but this is the time that love seemed to last. I found TurboKick – a cardio kickboxing class to fun music and fell in love. It was crazy cardio and it took me forever to get the hang of it, but i loved it, and I had the opportunity to practice it all the time at my new gym. Then I met my now husband, and we both had a desire to live healthier lives, so we decided to start making meals together to keep from going out to eat all the time. Fast forward about a year from there and he had dropped about 60 pounds, and I’d lost about 20 (life just isn’t fair, huh?). I decided to become a certified TurboKick instructor, and this helped kick things up a notch with my workouts. I also decided after watching my then fiancee complete his first sprint triathlon that I needed to cross the finish line of some race. I decided to start running utilizing the Couch to 5k program. I have always hated running and it always hurt – but I set my mind on completing a 5k and running the entire way. I think I hated literally every step of every run, but by God – I did it. I completed 3 or 4 5k’s before injuring my left leg. During this time of running, teaching turbo and watching what I ate, I got down to what I now blissfully refer to my “wedding weight.” Don’t get me wrong, I still had more to lose – but I was feeling good about myself and felt like I could at least start to visualize myself crossing this final finish line. (5k with obstacles). I’m still teaching Turbo once a week and I work out via cycling, cardio machines, circuit workouts, hot yoga – you name it. And yet, here I am…heavier than I’ve been in a long time. It’s frustrating. But that’s what brings me here – to this new adventure that I hope to share with you. I’ve got a new game plan and I guess we’ll see how it turns out. I am always the eternal optimist – so things are looking up. This is my Thirty Story. ThirtyStory · Sometimes funny, sometimes sad..always real.